Businesses nowadays understand the full potential of using different online marketing strategies to promote their brand and increase the visibility of their website in search engines. Digital marketing is also useful for bloggers and non-profit organizations to help them increase readership and add more value to their websites. There are actually many different strategies that can help boost the popularity of a website while providing maximum conversions depending on the target of the owner. Two of the most popular methods as of now include PPC (pay per click) and SEO (search engine optimization). While many business owners only use PPC solutions to boost the popularity of their websites, relying on this method alone can prevent you from getting long-term gains in the future. 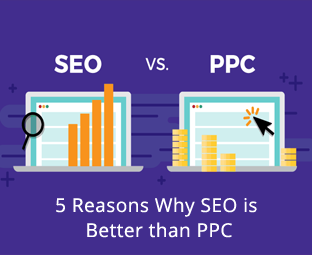 In this article we will learn about 5 reasons why SEO is better than PPC. 1. SEO continues to work for you. One of the main differences between SEO and PPC is the amount of time required for setting up these two marketing strategies. SEO may be a slightly more time-consuming compared to PPC in the initial phases. But after you have set up a systematic plan for an SEO campaign, all you have to is to observe the product create conversions for your website. PPC requires more time to monitor conversions, to optimize the strategies, and test which ones are working and which ones are not. 2. SEO has more long-term benefits. Pay per click services may guarantee almost 50% more conversions than SEO techniques, but the latter creates more potential for long-term growth. Websites that are optimized, starting from the content and the design to the user experience and uptime reliability, have more long-term value than those that are boosted using PPC. 3. Users are more likely to open optimized websites than promoted ones. Online users usually prefer clicking websites from organic search results as many of them are aware of how PPC websites can get on top of a results page with money. People know that most sponsored websites may not have as much quality as those that are developed using SEO techniques. This leads to a discrepancy of almost ten times more clicks on average for SEO websites compared to PPC sponsored websites in a search results page. 4. PPC is only applicable to one search engine or platform. Another reason that investing on PPC is not a good idea is that you have to pay for every search engine and social media platforms where you want your sponsored ads to appear. Whereas in SEO, it is almost a standard for almost every search engine to place high-quality, useful, and factual websites on top of the results page. 5. SEO is very cost-effective. By providing an affordable and long-term solution to your online marketing needs, SEO can be a very cost-effective option. PPC is a more expensive and risky form of investment that can cost you a lot if you fail to manage using this strategy properly. If you are looking for a great web design, marketing, and SEO service provider in your area, then make sure to check out Scott Keever SEO. With their expertise and proven track record, you can be assured that they’ll be able to deliver the results as needed. Visit their website at https://scottkeeverseo.com to know more.